It goes without saying that we’re staircase fanatics here at Jarrods. 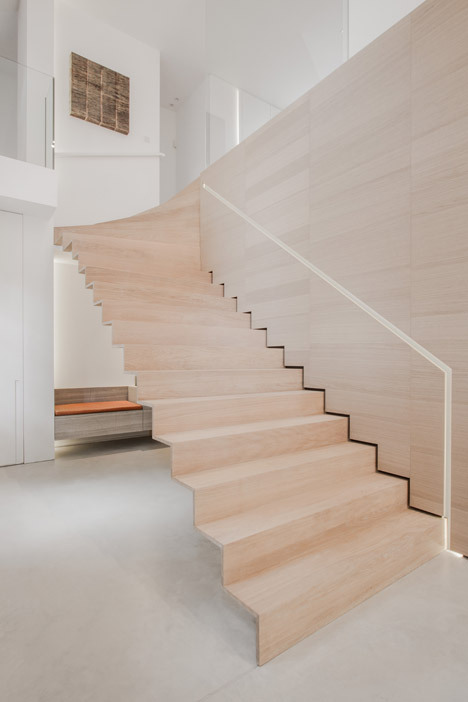 In our search for stunning staircases, we recently took a look at some of the best examples of staircase storage, so now we thought we’d look at some of the most innovative wooden staircases from across the world. Wood is considered to be a traditional medium for staircases, but it needn’t be boring. At Jarrods, we believe that the only limit is your imagination, and these three stunning wooden bespoke staircases certainly prove that! Granted, there’s nothing ground-breaking about spiral staircase, but this particular design is certainly innovative. Les Haras de Strasbourg, a four-star hotel and Michelin starred brasserie, wanted to create an authentic yet modern environment. The building was previously an eighteenth century equestrian academy, so they wanted to create a natural yet luxurious interior design that was inspired by the equestrian world. The staircase played an integral role in achieving this. There were a limited number of materials used, including solid wood, natural full hide leather and blackened or brushed metal. 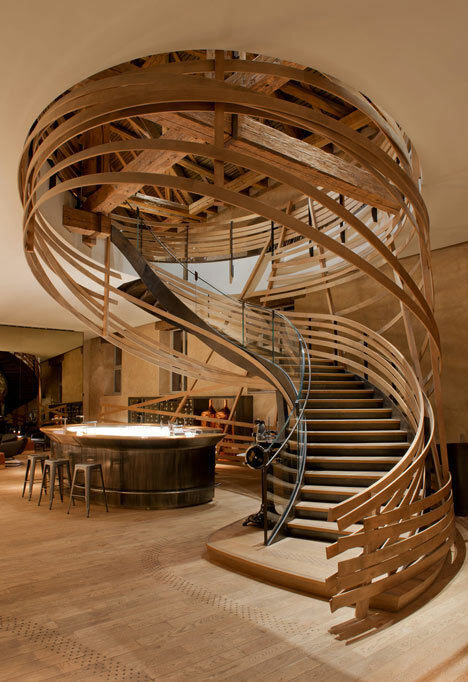 The curving staircase is encircled by a structure made of oak elements, which goes on to link the two floors of the brasserie, before forming handrails on one side and a sleek balustrade around the top. The timber elements extend from the spiral to create a bespoke wine rack along the back wall of the brasserie. A family home in Santiago de Compostela, Spain was renovated by Arrokabe Arquitectos architects. One of the most distinctive design features of the house is the new staircase that runs all the way through the property. As you ascend the staircase, you’ll notice that the structure gradually becomes suspended and lighter to relate to the different themes of each floor. By creating one continuously evolving staircase, natural light is maximised to reach all levels of the property. Image source: Nils Van Brabant. 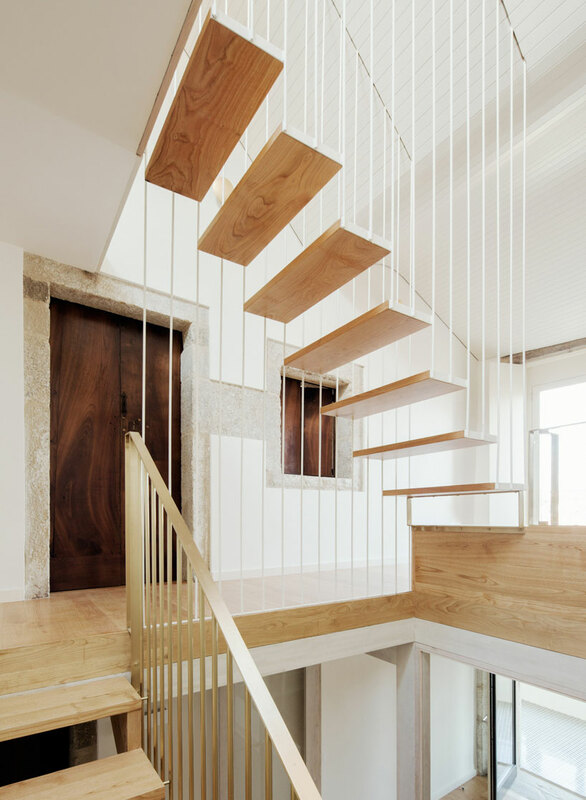 Forget sliding doors, sliding staircases are the new interior design trend to watch out for! A couple in Belgium wanted to create a minimalistic home and sourcing the right staircase was imperative to the design process. The new space was so large that the couple and their interior designers both decided that it needed something different to a traditional staircase. Sticking with the minimal theme, they opted to create a single fluid line that you could pull out from the wall to reveal a staircase. The end result is a staircase that appears to slide out from a veneer-clad wall and extends towards the first-floor landing. The wooden stairs appear sleek and slender but are supported from underneath by a white-painted steel structure. The staircase then cantilevers from a hidden beam within the veneered wall. There’s a makeshift handrail for the staircase in the form of a narrow slit within the veneered wall; the other side is left completely open. As the couple have no plans to have children, they’ve decided to leave the other side open to add to the staircase’s minimal aesthetic. If these stunning staircases have ignited your imagination, get in touch today and we’ll work with you to create the staircase of your dreams.